Gary Johnson will be seeking an Isle of Man podium this weekend as he returns to the island for the Superbike Classic TT. The rider, from Broughton, near Brigg, has been an ever-present at the race since its first edition in 2013, but a late call-up helped him preserve his record. Johnson will contest the four-lap race on Monday for Team York Suzuki/Big Dog Classic Racing, having replaced near-namesake David Johnson in the team. 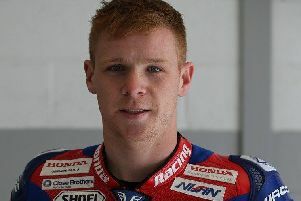 The Australian rider was forced to withdraw with injuries sustained at the Ulster Grand Prix. Johnson will ride an XR-69 1100cc Suzuki for Kevin Pearson’s York-based team and will be seen as one of the podium contenders. He said: “I’m delighted to be joining Team York Suzuki for the Classic TT. “Obviously it is a shame that Dave can’t ride the bike due to his injuries and I wish him well in his recovery, but hopefully I can build on his performances for the team last year. For the last twJo years, the two-time TT winner has competed in the race for Roger Winfield where he has ridden one of the 1200cc Harris Yamahas. He was forced to retire from fifth place in 2014, but bounced back 12 months ago to finish eighth having lapped at 121.332mph on his opening lap.